Based on the assassination of Tamil Politian Rajiv Gandhi in May 1991 by Thenmuli Rajaratnam who wore a belt of explosive material attached to her lower back region with the switches and circuitry in front. Director and writer Santosh Sivan, a well known Indian cinematographer, wanted to make a film about terrorism he chose these real life events for the basis of his story. 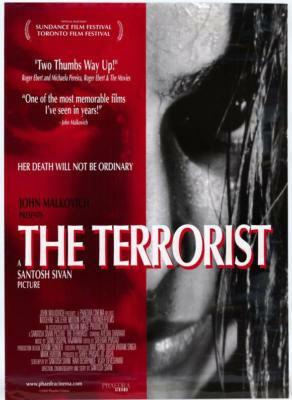 The Terrorist (1999) portrays a period in the life the 19 year-old Malili (Ajesha Dharkar) who was overjoyed to be chosen to assassinate a leader in South Asia via the suicide bomb strapped to her. Asked to sacrifice her life for the future of her people the film explains how, in slow precise detail, Malili develops doubts about her deadly mission. Thought provoking and very beautifully shot with what seems constant Indian downpour’s playing their part in the overall atmospherics of the movie. Considering the subject matter violence is almost non-existent. John Malkovich was so impressed with the film that he put pressure on to have it released in America. Well worth a look.